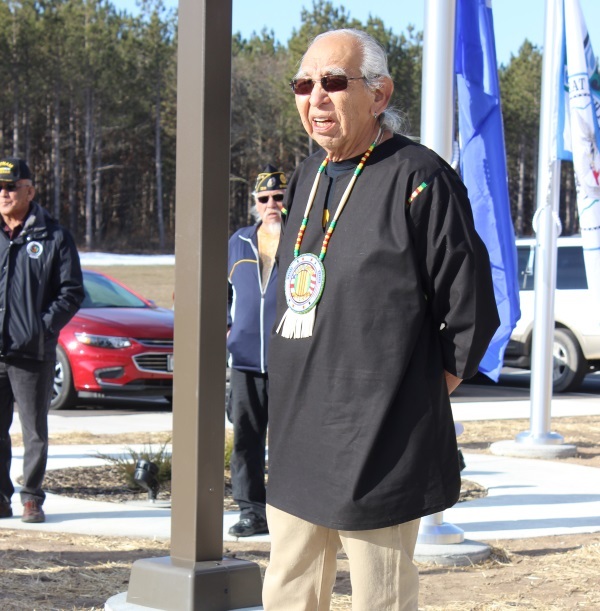 In observance of National Vietnam War Veterans Day, the Ho-Chunk Nation’s Division of Veteran Affairs held a flag-raising ceremony in Black River Falls last month. The event took place on March 29, at the new District 1 Community Center. As one of the tribe’s many drum groups performed the “Flag Song,” former service members raised the three flags flown in front of the building – one representing the United States, one the state of Wisconsin, and the other the Ho-Chunk Nation. Immediately following the flag raising was a 21-gun salute by American Legion Post 129 and a performance of “Taps,” played by Jackson County Veterans Service Officer Randy Bjerke. United States Navy vet Andy Thundercloud then addressed the crowd on behalf of the Nation. He welcomed everyone to the facility, which opened in January, and invited them into the gymnasium where the rest of the ceremony would take place. Once inside, Traditional Chief Clayton Winneshiek gave the invocation. The chief said he could only imagine what it must have been like for the men and women who sacrificed so much, only to be condemned by their fellow countrymen upon returning home. Vietnam veteran Cleland Goodbear served as guest speaker for the day. Despite all the decades that have passed since the war, Goodbear said he can still remember everything. He then described what it was like for service members coming home from the war. Nevertheless, he said his fellow veterans should be proud of what they did, in spite of the negativity once directed toward them. The event ended with Post 129 retiring the colors, and a homemade meal for all the veterans in attendance.